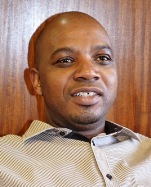 Mr Sakhi Simelane is General Manager: Finance (CFO) at Mintek. He previously worked as the Chief Financial Officer of the then Department of Minerals and Energy and as Chief Audit Executive and Internal Audit Head at the South African Revenue Service (SARS) and other institutions in the auditing sector. He provided auditing training in the private and public sector and thus has extensive experience in the Accounting and Auditing fields. In 2004, he won the prestigious award of being the Internal Auditor of the Year (SA) from the Institute of Internal Auditors and he was further appointed to represent South Africa in the Internal Audit setting body in the USA for a year. Mr Simelane served as the chairperson for the FASSET Audit Committee for six years and Audit Committee member and Chairperson of the Risk Committee in various Government departments. He is currently the Audit Committee Chair for The Economic Development Department, member of the Audit and Risk committee for the University of South Africa (UNISA) and the Office of the Public Service Commission. He has recently been appointed to serve as a Council Member of UNISA. Mr Simelane holds a BCom (Hons) degree and is currently completing an MBA degree with Regenesys.